In April of 1995, PC Gamer posited that the hot new 6DOF shooter Descent might just be the Doom-Killer. Clearly, we were wrong, but even so it was an important and influential game, and really good, too. And now a number of the people responsible for creating it, including the co-founders and programmers of original Descent studio Parallax Software, have headed to Kickstarter in search of funding for a new 6DOF shooter called Overload. At the same time, the developers also promise “a rich backstory and universe ripe for expansion,” being written by the writer of the brilliantly good Freespace 2. 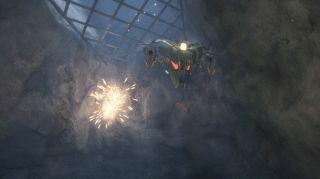 Naturally, it will also sport top-notch graphics technology, with physically-based rendering, dynamic shadows, realtime global illumination, and “beautifully rendered particle effects”—robots will blow up real good, in other words—and feature music from the composers of Descent 2, Freespace, Red Faction, Dungeon Master 2, and many other games. It's interesting to note that this is actually the second recent Kickstarter to be directly descended from Descent: In April 2015, the officially licensed sequel Descent: Underground, being developed by a team that has no connection with the original game, just barely squeaked past its $600,000 goal. Overload, the unofficial follow-up being developed by the (largely) original squad, is looking for half that amount. The Kickstarter campaign runs until March 11.